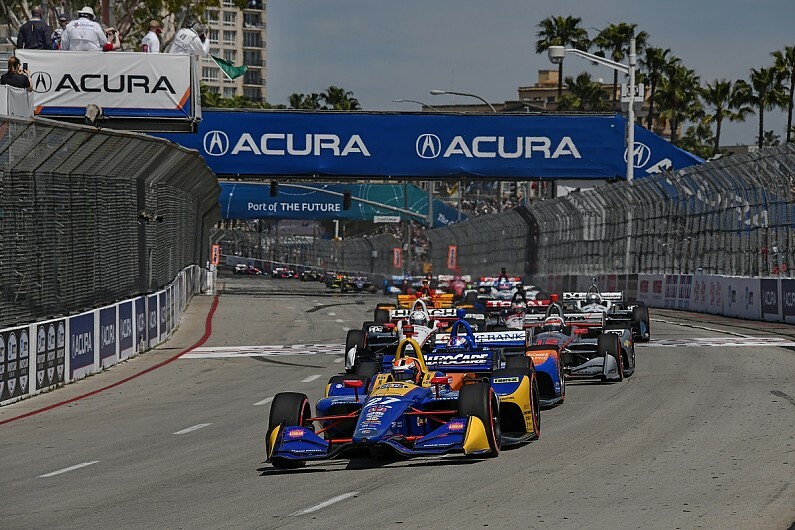 Alexander Rossi put on a masterclass to win IndyCar’s Long Beach Grand Prix for the second consecutive year and claim Andretti Autosport’s 200th win across all categories. Poleman Rossi led from the outset, with his only true challenges for the lead coming from Scott Dixon both at the start of the race and on the restart following an early caution period. Josef Newgarden increased his championship lead to 28 points by finishing second – but was 20 seconds back from Rossi. Newgarden, who had to contend with a minor electrical issue at the start of the race, was able to cut Rossi’s lead twice by pitting later and making the most of the clear air ahead to set fast in-laps. While he was able to cut the gap to Rossi on both occasions, it was never by enough to have any real bearing on the race lead. But Newgarden’s pace prior to his second pitstop allowed him to emerge ahead of Dixon, who had run in second for much of the race but had a refuelling problem during his own second stop. Though that cost Dixon considerably, he had never looked like a credible threat for the race win. He lost out to Graham Rahal and Ryan Hunter-Reay as well as Newgarden in that pit delay on lap 56 of 80. Rahal, who started sixth on the grid, pitted before the leaders during the final cycle of stops, and his strong pace on older tyres compared to his rivals allowed him to finish third on the road. But immediately after the race he was relegated to fourth because the stewards judged that Rahal had blocked Dixon during a last lap battle between the pair. Hunter-Reay ended up fifth, passed by Dixon while running on old tyres and needing to save fuel late on. 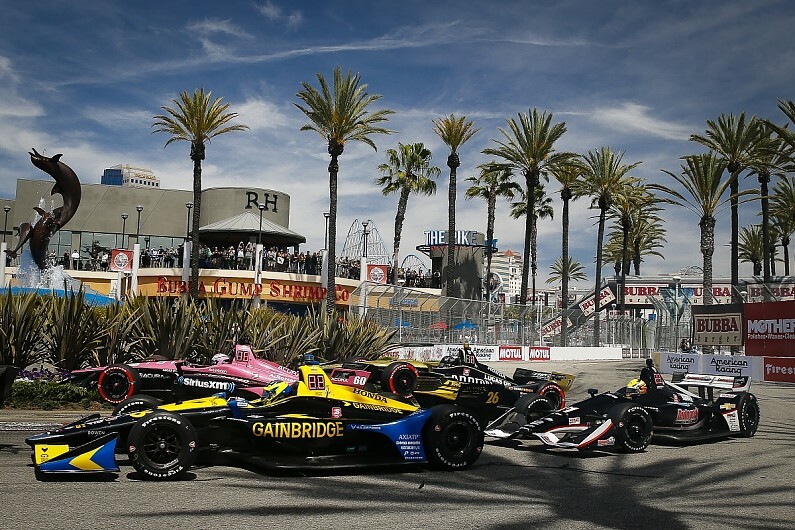 Simon Pagenaud took his best finish of the year so far in sixth, one spot ahead of Penske team-mate Will Power – who faced a pair of difficulties during the race that cost him a chance of a podium finish. Power had an overboost issue shortly before half-distance that slowed him at the hairpin, then locked up at the first turn and went down the escape road on the following lap while trying to defend from a move by Dixon. Takuma Sato, who dominated last time out at Barber Motorsports Park, finished eighth, ahead of James Hinchcliffe, while Felix Rosenqvist recovered from his qualifying shunt to complete the top 10. Colton Herta was the only driver not to make it to the end of the race. IndyCar’s youngest-ever winner had shown strong pace and had ran in the top 10 for most of the race until contact with the Turn 9 wall on lap 50 ended his race. Jack Harvey finished three laps down after being involved in a lap one collision at Turn 2 with Spencer Pigot and Marcus Ericsson. The incident brought out the only caution of the race. Ericsson was judged to have caused the collision and was given a penalty. The Formula 1 convert was classified 20th and two laps down.